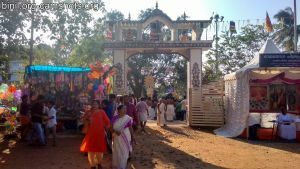 Valarkavu Sree Durga Bhagavathi Temple is located in Valarkavu, Thrissur district, Kerala. Its around 4km away from Thrissur Swaraj round (via the Mannamangalam/Kuttenellur road). The main diety (Bhagavathy or Bhagavathi or Bagavathy) here is considered to be the sister of Kuttanellur Bhagavathi. Both poorams are on the same day. 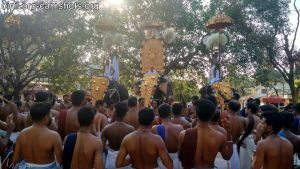 Below are pictures of Pooram on 20th Feb 2019. You can reach the temple by boarding bus towards Kutenellur from Sakhan bus stand Thrissur.